At the very outset of this review a few things should be noted, first that these are opinions based on the personal. By that statement above, I begin this article much as Nietzsche would have appreciated. Through recognition that almost every opinion expressed is one of individual essence however it is through his views that he quickly adds that he will not attempt to show his philosophy in a garb of anything other than the personal. His philosophy of identification results in the increase of true or false dichotomy expressed relationships (love/hate, good/evil, human/nature). Through 10 sections of philosophically expressed abstracts, Nietzsche sets forth his ideal to his countrymen in resounding and powerful words. However, I cite an older and Italian philosopher Gaetano Filangierie's La Scienza della Legislazione, "The philosopher should not be the inventor of systems but the apostle of truth... citizen of every place and every age, the philosopher has the world for his country, the earth for his school, and posterity will be his disciples". It is by this mark and in the spirit of that quote that this review is written. To attempt to hold Nietzsche to such an ideal is a quick disappointment. His philosophical abstracts oftentimes amount to vehement rants and monologs praising or deploring different examples. 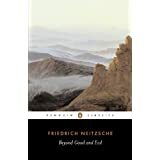 This work Beyond Good and Evil (1886) follows after Thus Spoke Zarathustra, and Nietzsche was admittedly wise in deciding not to use the pretentious mask of Zarathustra to vent his ad hominum attacks. These attacks are many and considered by many persons, including the writer, to be weak forms of philosophical argument vented at the individual or group in question. These are very personal attacks and show a not so "superman" perspective of the world. The "will to thought" is here and of course his own "will to power", but after such a promising philosophical and literary achievement as Thus Spoke Zarathustra (1883-1885), it shows the remarkable weakness developing in Nietzsche's mind eventually leading to his mental collapse in 1889.